The city of Baton Rouge offers plenty of seasonal events that keep the community and visitors engaged throughout the year. Although you might not be able to make it to all of them, we at the Armstrong wanted to share our list of seasonal events you won’t want to miss. It doesn’t matter if you’re in the mood for holiday parades or live music, Baton Rouge has just the thing to help you make it through the season. So get up, get out, and experience Baton Rouge like never before! The Louisiana Marathon is a great way to start the year in an epic way. The marathon offers different races to accommodate every participate (Half Marathon, Marathon, Kids Marathon, etc.). There’s also plenty of celebration, music, and Baton Rouge culture to enjoy after the races are over. How about taking the party out to the streets of Baton Rouge. The Mystic Mardi Gras Parade has been a yearly tradition that has been creating rich memories since the 70’s. It is one of the longest running parades in the city that is for all of Baton Rouge and not just specific communities. The Krew of Southdowns Mardi Gras Parade offers a family friendly environment and plenty of fun to enjoy. From start to finish, the parade features plenty of live music and cheer to get you going. Most of the floats and marchers are covered in bright lights that make things more interesting. Just remember that everything is handmade, which adds on to the significance of the whole extravaganza. This awesome recurring event is completely free and allows Baton Rouge to check out an impressive lineup and plenty of blues legends. The Blues Festival has plenty of entertainment ranging from outdoor and indoor settings for everyone to enjoy. Keep an eye out because you never know when you can run into any of the musical legends! The LA Sports Festival ignites the most competitive spirit you will find in the summer. The festival features obstacle courses races, running, hiking, and other competitions to help keep you active and spectate other athletes. Of course, everything is done for the love of sports and communion so there’s also plenty of music, food, and festival activities. The Oyster Festival is one of the newest recurring festivals to the Baton Rouge area. This unique event features everything oyster, even the pearls! You’ll have a blast going up and down the Baton Rouge riverfront and exploring what kinds of goodies this celebration can bring up. The Capital City Seafood Festival marks the end of the summer season and the beginning of the fall. The celebration features the best of fresh local seafood, music, and plenty of activities for all members of the community to enjoy. It’s the best time to get the tastiest sample of the south’s cuisine surrounded by a great environment and wonderful people. The Baton Rouge State Fair features all the thrills, chills, and family excitement you need for the fall. This Baton Rouge seasonal event usually comes around the end of October and lasts through November every year. Apart from the great rides and cotton candy, you’ll run into an impressive gospel, rock, bluegrass, country, blues, zydeco performers that can get any crowd going. Just remember every day features a different special guest, so be sure to keep up with the fair’s calendar. Just under an hour drive from Baton Rouge is the Cajun Country Corn Maze. This has been one of the top fall attractions near the Baton Rouge area for the last couple of decades. The corn maze makes its way through a family-owned farm and features a petting zoo, pig races, duck races, and other family-friendly activities that won’t disappoint. What’s the fall season without a good haunted house? The 13th Gate Haunted House has 13 different areas that are sure to do the trick and spook you and your friends. Every year seems to bring scarier ideas to the haunted house as it has over 100 professional actors and great makeup artists that help create the best haunted house scene in the state. The Hot Air Balloon Festival in Gonzales is one of the most beautiful scenes you just have to witness in person. Many hot air balloons are taken into the air and race for the top prize. 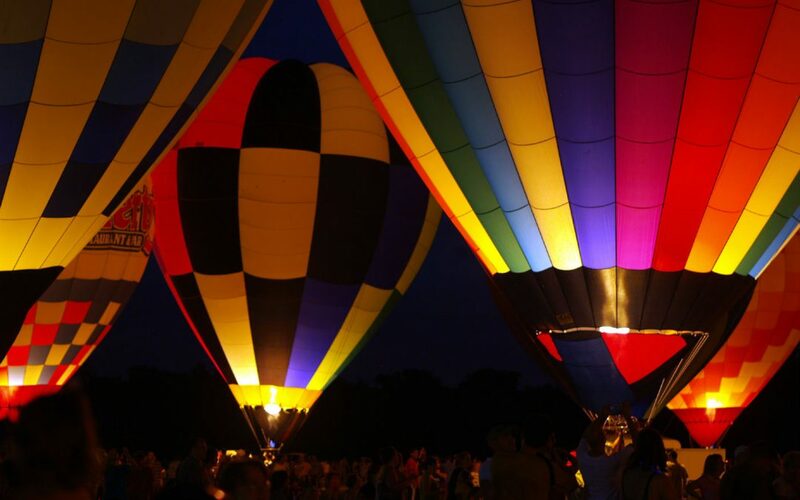 There’s plenty of unique hot air balloons, food, rides, and live entertainment for a day trip away from Baton Rouge. A holiday tradition since 1949, the Baton Rouge Christmas Parade drawn tens of thousands to their television screens and the downtown area every December. The parade usually includes around 80 entries including floats, marching bands, celebrities, local businesses, and other fun displays. It’s a great event to attend with your family and friends. Who doesn’t love holiday lights? The Holiday Lights at Baton Rouge General is an awesome light display for all members of the community to enjoy. The light display usually opens around mid-December and features over 100,000 lights, live music (on select days), local food trucks, pictures with Santa, and other holiday favorites. One of the most anticipated displays is the 9-foot Cajun alligator light display that represents the Baton Rouge community spirit. The Baton Rouge Zoo also hosts a popular light show of its own. A fun walk through the zoo allows visitors to witness light displays of their favorite Zoo animals and other fun family activities. There’s no better spot to welcome the New Year in Baton Rouge. Head over to Red Stick Revelry right before the New Year if you want to celebrate in style. Red Stick Revelry features a live concert that starts around 7 p.m., fireworks, and other free festivities that will have you going back next year. Mid City Rising is the perfect monthly event for both artists and art enthusiasts to get together and enjoy the best in music and live entertainment. Plenty of musicians and artists showcase their own work and put on some of the best live performances in the city. There’s also delicious food to help make things even better! You can enjoy great musical performances and an upscale dinner every other Wednesday at the Tallulah. The venue has some great entertainment lineups that any local and visitor will enjoy on a Wednesday night in Baton Rouge. Did you like our article about Baton Rouge Seasonal Events? Don’t miss out on our blog Outdoor Fun in Baton Rouge!